static Config = env("WINDIR") ++ "\wincmd.ini"
Three first numbers are of greatest interest. The very first is a total number of [user] menu items that can not exceed 200. If your number is close to it, you should "clean up" your menu or reorganise it. Second and third numbers must be equal. 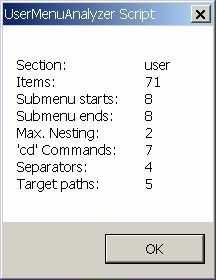 They show hao many submenus are opened, and closed, respectively. Remaining numbers are mainly for the curiousity or reference purposes. After pressing OK the similar information about the [DirMenu] is provided.